Trois-Rivières (Que.) – August 17, 2017 – UFCW Canada Local 500 members working at the Super C des Récollets in Trois-Rivières, Quebec have ratified a new seven-year collective agreement that brings wage increases, vacation improvements, and more. As part of the new contract, wages will increase 2 percent in each year of the agreement for the grocery store workers in the Mauricie region. The wage scales have also been redrafted to take a rising minimum wage into account. As well, the workers will get a fourth week of vacation after nine years of continued service, rather than ten. The agreement includes a new job classification of regular employee, working 32 to 40 hours a week, with the usual benefits. That means there are now two different job positions in the store: regular employees working 40 hours, and regular employees working 32 to 40 hours. The employer will continue contributing $0.18 per hour per worker to the UFCW Quebec Dental Plan. If necessary, the contribution will be raised to $0.19 so that the plan can continue to reimburse 80 percent of eligible dental costs. 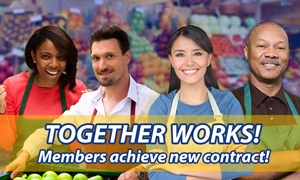 “Congratulations to the Super C members who took part in negotiations for this new contract,” says Antonio Filato, the President of UFCW Canada Local 500. “This agreement provides members with stability for years to come, and further demonstrates that our union is always there to support and represent members’ interests,” he adds.